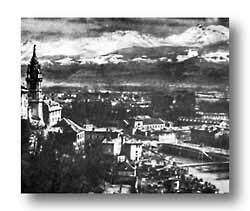 On 22 August elements of the 143rd Infantry entered Grenoble, lovely university city nestled beneath the French Alps. "Welcomel" shouted the towns newspaper on the first page. 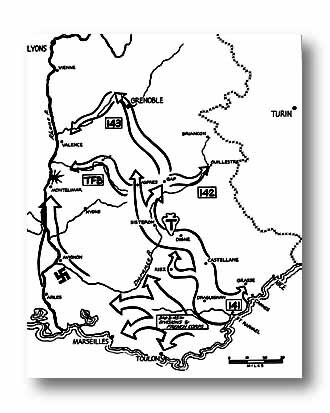 "Yesterday, without warning, we saw them suddenly rising up at the far end of the Cours Jean-Jaures ... those well-built boys in khaki, those strong, calm fellows who in 1918 had shared with the Poilus in horizon blue all the sufferings of battle, all the joys of victory. The mademoiselles of Gap rewarded their liberators smilingly. Monsieu L'Americain GI was delighted. Radio Team stops along the way. "At first no one dared to believe it. The Americans? They are here? Already? 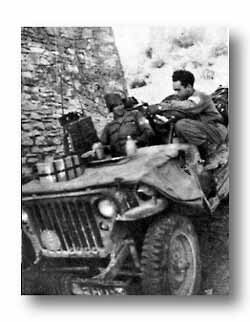 At last, astride their funny little jeeps, perched high on their heels, reminding one of the far west, piloting their General Sherman tanks, henceforth so well-known along the Route Napoleon. "The crowd massed all along this fine avenue, just as it used to do in the good old days of the Tour de France. 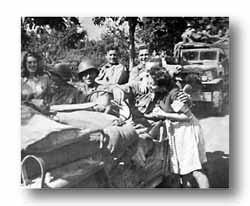 What a glorious Tour de France is thisthe wildly enthusiastic crowd, which shouted its welcome to the liberating troops of the FFI, triumphant with its tri-colors waving in all the streets of the town, found fresh vibrant voices to shout an enthusiastic welcome to the big attractive giants. "Welcome to you all! You who have come from the distant provinces of Illinois, Ohio, Alabama, or Texas.... Welcome to the citizens of New York and San Francisco, you all who have come after a stage in our North Africa to help France get rid of a nightmare which has lasted four interminable years, and to aid her to rediscover her true soul. "Welcome to Grenoble, our town. Welcome to the Dauphine, our province!" 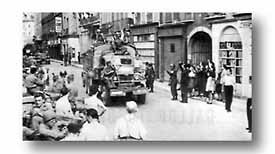 GRENOBLE GREETSGrenoble, only fifty miles from Geneva, was gay in her hour of liberation. Throughout the Alpine valley the bells of the university tolled and reverberated. GIs were fascinated by the Swiss influence on the citys architecture. GALLOP TO GRENOBLE - Click on the map to view a larger image.